On September 14th, two Israeli settlers attacked a Palestinian shepherd and two international near the Israeli outpost of Mitzpe Yair, in the South Hebron Hills area. During the aggression, the settlers stole video cameras from the internationals and broke one of their phones. Israeli police detained the Palestinian shepherd and one of the internationals for six hours. There were no consequences for the settlers. At about 9:00 a.m. four Palestinian shepherds from the South Hebron Hills village of Qawawis were grazing their flocks accompanied by two internationals, on Palestinian owned land nearby the Israeli outpost. 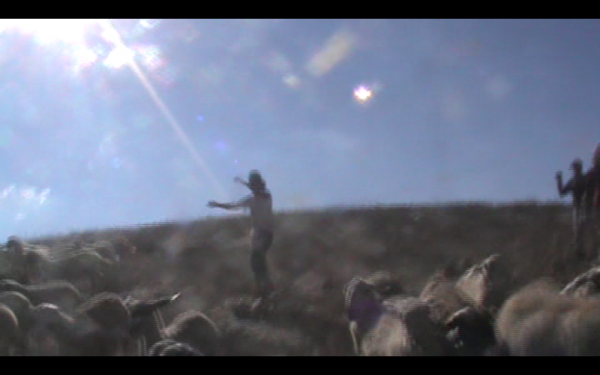 Two settlers from Mitzpe Yair crossed a closed area (where the access is forbidden to everyone else) in order to attack one Palestinian shepherd, starting to chase away his flock. The two internationals present taped the scene. 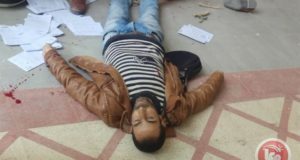 Afterwards the settlers assaulted the internationals: at first they grabbed one by the neck and knocked him down, they snatched his camera and broke his phone; subsequently the settlers attacked the other one twisting her arm and also seizing her camera. 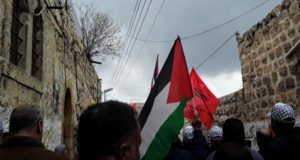 The settlers ran back to the outpost holding the stolen cameras, and the Palestinian and the internationals went to Qawawis village. The Israeli police came to the Palestinian village and asked the shepherd and internationals to follow them to the Israeli Police station in Kiryat Arba settlement, due to one settler claiming that they threw stones at him. The Police officers detained both of them for six hours and questioned them about the incident. Israeli police released them at 5:00 p.m. without consequences. The South Hebron hills area has suffered from the presence of Israeli settlers’ since the 70’s. Eight Israeli settlements and outposts (among which Mitzpe Yair is one) almost completely isolate 16 Palestinian villages from the rest of West Bank. 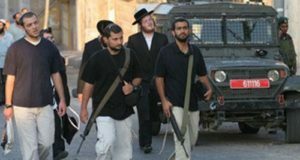 The settlers’ violence includes overt violent attacks on Palestinians and their animals, damages to private properties, and limitations to freedom of movement with many consequences on their daily life. Since the beginning of 2014, Operation Dove registered the arrests of 15 Palestinians, included minors, because they were on lands near the settlements. During the same period there were no consequences for Israeli settlers involved in the incidents occurring in the area. In spite of the violence suffered by the Palestinians from the South Hebron Hills area, they keep on grazing and farming on their lands, resisting in a non-violent way to the Israeli occupation.